Fantastic Beasts: Crimes of Grindelwald ... Racist casting? Harry Potter created more than a bit of buzz this week when Warner Bros released the final trainer for Fantastic Beasts: The Crimes of Grindelwald. In the trailer, Nagini is introduced as a woman years before she becomes Voldemort’s snake and Horcrux. In the movie, Nagini is a Maledictus, a human cursed to change into a beast. The buzz—the negative buzz—came largely from the fact that the role is being played by South Korean actress Claudia Kim. The backlash noted that Fantastic Beasts has only two people of color in the main cast—Zoe Kravitz who plays Leta Lestrange being the other one—and to have one of them play a snake who ultimately is subservient to Voldemort felt wrong. Others said it perpetuated a dragon lady stereotype. A fan wrote on twitter—our new public square—“listen Joanne, we get it, you didn't include enough representation when you wrote the books. 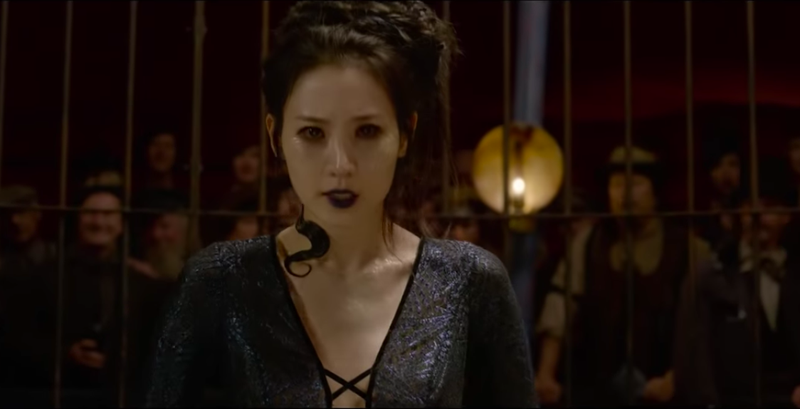 But suddenly making Nagini into a Korean woman is garbage. Representation as an afterthought for more woke points is not good representation” which elicited a response from J.K. Rowling defending the casting. Rowling explained that Nagini’s Asian heritage was built into the character from the very beginning. That, of course, won’t be the end of it, with people who never had any intention of seeing the film anyway weighing in. I’m one of those people. I’m just not a mega fantasy fan and as I’ve pointed out here earlier, all the CGI and special effects leave me cold. I’ll weigh in, in any case that while I understand the concern, I appreciate the fact writers are beginning to try to broaden their perspective and make efforts to be more inclusive in creating their characters and that film directors are making attempts to be more inclusive in their casting. It’s a start but clearly we have a long way to go. Watch the trailer and let me know what you think. Oh! And have a lovely day! opens nationwide on November 16. What bothers me more is when Hollywood changes characters drastically from the books. Case in point - Have you read The Passage series by Justin Cronin? The TV version has drastically changed the characters making the shy 10 year-old red-haired white girl into a black girl with an attitude. Waaaa? It changes the series tone. That's just one example. Just weighing in here.